The Restrictions menu on the iPhone is terrific if you have a child with an iPhone, or if you work for an organization that needs to limit what people can do with their phones. Restrictions are easy to set up and change, and there is a surprising amount that you can accomplish by simply adjusting some of the options on that menu. But you might find that you no longer need to use Restrictions on an iPhone, and that you would like to turn them off. 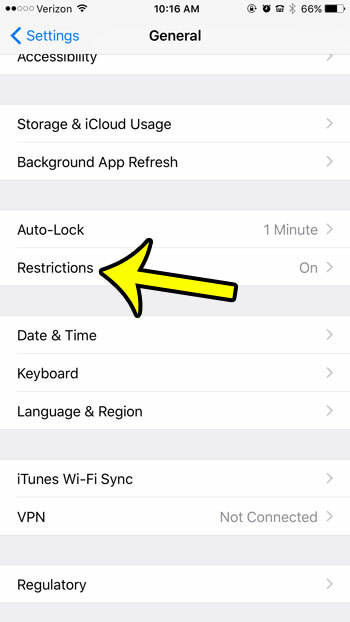 Our guide below will show you the steps to take to disable Restrictions in iOS 9 and regain control of a fully-functional iPhone. 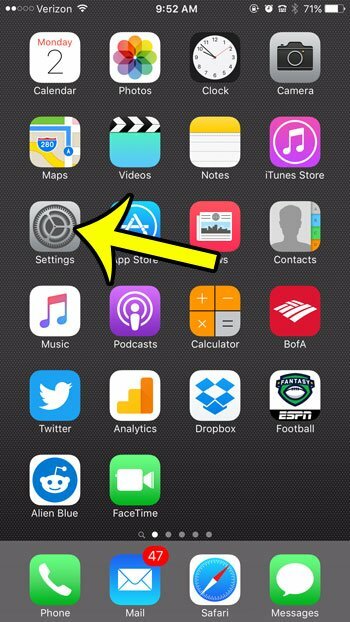 The steps in this article assume that Restrictions are currently set up on your iPhone, and that you wish to turn them off completely. 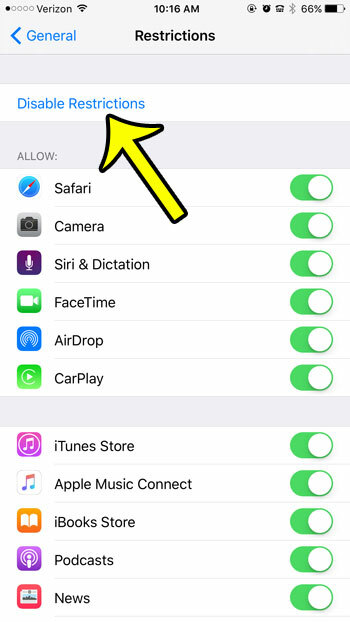 Turning off iPhone Restrictions using the method below will require you to already know the Restrictions passcode. 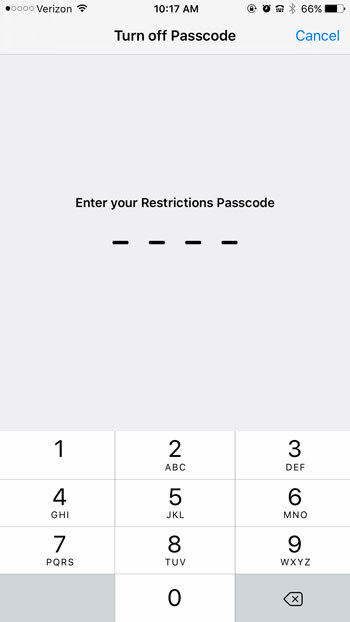 Note that the Restrictions passcode may be different than the passcode that is used to unlock the device. If you want to remove Restrictions but you do not have the passcode, then you will either need to set up the iPhone as a new device, or you will need to use a third-party tool to extract the Restrictions passcode from the iPhone. Step 3: Tap the Restrictions option. Note that if Restrictions are currently enabled on the device, it should say “On” next to it. Step 4: Enter the current Restrictions passcode. Step 5: Tap the Disable Restrictions option at the top of the screen. Step 6: Enter the Restrictions passcode again to finish turning them off. 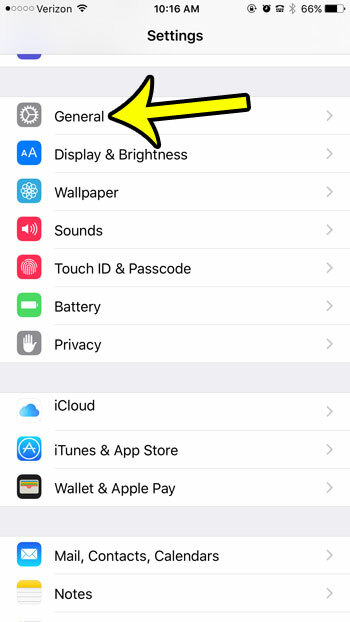 Note that every feature of the iPhone is available once Restrictions have been turned off, and any websites that were previously blocked will be accessible. Additionally, turning off Restrictions will not affect the device passcode that you need to enter to unlock the device. You can click here to learn more about changing or disabling the iPhone device passcode.